One of our first articles. We wanted to repost for various reasons, but most importantly to celebrate 3 years of viewership! The day of Recovery, if not The day of Rest. The one day of the week when it’s OK not to work; to not even consider work, and not obsess upon the waiting tasks you’re not accomplishing. A time-out—that half-a-weekend without even Sunday’s frantic early-morning combing of little boys’ hair, prior to herding them into the car for church—for which you’re already late. Saturday is a time to breathe, to recharge, to slow down without the worry of being overrun; a hiding place for the soul to regroup and to somewhere locate the strength and the will to continue on into another workweek. This particular Saturday came to life slowly—a cold, rainy day in January on which the early morning ice fog refused to concede dispersal, but rather fought to continue throughout each successive daylight hour; a thin, wet, steel veil—but one more an affectation to a person’s mood than visible to his eyes. Despite the weather, though, this was my Saturday. A Saturday I had negotiated from my wife, and wrestled from the hands of my children. A Saturday which would—for the bulk of its early, delicious hours—belong to me alone. 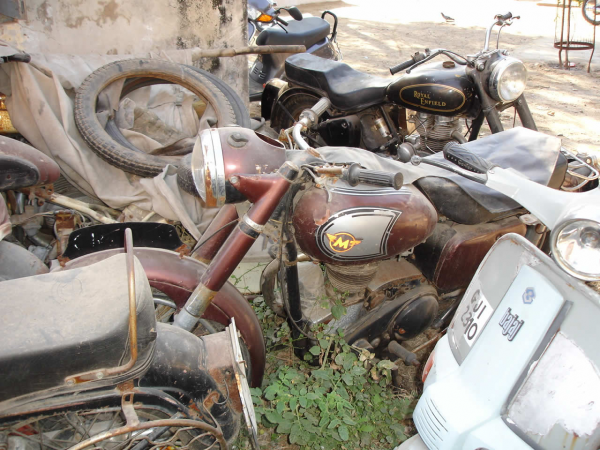 A fan of old motorcycles (“old” referring to those motorcycles I had or wanted to have, when both they and I were newer), I’d begun collecting a few antiquated dirt bikes recently. I’d enjoyed my first restoration—a 1970 441 BSA—several years earlier. By this time in my life, a diverse little stable of oddball machines had already arrived to spend their retirement in my basement, and my favorite among those then-very-distinctive, pre-plastic brands, had always been Maico; two of which were now residing with me. However, I’d been forced to put my bike interests on hold for the last year or so—at least as regards the spending of any significant quantities of time or money—due to having left my former career and being now totally absorbed in hacking out the underbrush of a new one. Besides the reality of little money, I had removed myself for reason of feeling that I really didn’t deserve such an indulgence . . . I was, after all, decidedly behind the material power curve. While my peers were now comfortably settling into their respective careers as airline pilots, mid-level managers or businessmen, I was starting all over. While they were in the process of planning and building beautiful new homes in which to raise their beautiful growing families, I had returned to rent the little house I had lived in as a kid—and that with a very charitable rental rate, afforded us by my Dad. Not many months before I had flown a multi-million-dollar aircraft in the Marines and been addressed as “sir”. Now, I was taking an extra job at night to make ends meet, loading packages on the 10:00pm to 2:00am shift at UPS (a work shift on which it is impossible to feel good, if only for the freakish experiment the time slot is on a human’s biorhythms). My supervisor—an awkward, uncomfortable kid ten years my junior—would refer to me as “Ace” and write in his evaluations of me that I “lacked urgency.” He was probably right. I did lack a little “urgency” loading the continuous stream of brown boxes onto the little brown trucks, maybe, but I felt plenty urgent about what the hell I was going to do, otherwise. Perhaps one can only effectively channel a finite quantity of urgency. Was I foolish in leaving a comfortable and respectable profession in which I had done well but seldom been content—for a tenuous and insecure career as . . . an Artist? What was I thinking? Given the eclipse of commercial illustration by photography, becoming an artist in the late 20th century was the equivalent of entering the professions of blacksmithing or wilderness scouting—wonderfully romantic, but not very practical. Was I stupid and irresponsible . . . or, did I just perceive that merely everyone else thought that I was stupid and irresponsible? Add to this a young family, used to a comfortable lifestyle, and you had a Man under Stress. A Guy in Need of a Saturday. Desperately. Time to go hunting. After an early morning of household details, I loaded my old Chevy van—the “MiRV” (short for Motorcycle Recovery Vehicle—named the way the Naval service would slap an acronym on a piece of equipment by taking a syllable of each word in a full name or phrase; love that language. “ComNavAirSysCom” Just rolls off the tongue. )—with several mission-essential items: gloves, tie-downs, map. The former would hopefully be needed to load and secure my quarry; the latter would navigate me to the residence of “Jon”, a man who, yeah, had a couple of old Maicos out back, and yeah . . . he’d sell them, he guessed. The two Maicos at home would love some company. (The ’74 501 had cost me five hundred bucks, and the 250 two hundred. Was I crazy to be spending so much money on these old dirt bikes??). Leather jacket, wallet with cash (“bullets”, in our local old-bike-hunting vernacular), checkbook (for bigger bullets—but not always usable), and baseball cap (to establish fashion bond with country folk) completed my preparations. I’d calculated my Estimated Time of Departure to be 12:25; this allowing 60 minutes time en-route, 10 minutes for gas fill-up, 15 minutes slop time (to get lost), and an arrival 10 minutes prior to the appointed meeting time (“If yer not EARLY yer LATE!”, I recall certain authority figures saying). As I slip the van into gear and pull out of the driveway, up the street and onto the highway entrance ramp, prior weights and stresses begin to evaporate . . . the deadline next week; whether to go after that job in Texas. As I merge onto the interstate and enter the blurry grey curtain of rain and mist—lights on, wipers intermittent—the week’s concerns fully disappear, and I gently re-enter a world of adolescent excitement. One pretty simple, actually—composed then essentially of girls and dirt bikes and everything having to do with the two of them. 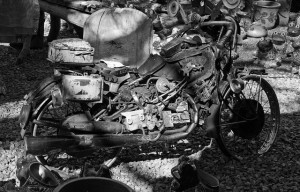 This part of the process—looking for the old bikes of my ‘70s past—usually carried another sensation; the same feeling as being in the woods with a rifle on a still day. Waiting, senses accelerated, concentrating wholly on that sound—that rustle in the leaves yards away. Slowly, you turn to look. What will be there? Will this old van be weighted down with the object of my hunt several hours from now—rendering me thus artful, competent, and successful . . . in at least something? Will I posses this treasure, that trophy of fur in the forest—or in this case that something we kids could only dream of from the pages of magazines . . . today? A gem or junk? Sometimes hard to tell! The rain is constant and unrelenting. Combined with the frozen ground, flooding’s now a possibility. I follow the highway past Indiantown Gap to the east, then cut north and back east through Swatara Gap. The highway now ascends slowly, pulling the trucks, cars, and my old Chevy van progressively higher and into the weird Schuykill County weather, onward through the rain and ice-fog and clouds. The trees are large and mature, spaced well back from the smooth, straight, climbing interstate. Burnt umber sticks reaching up from that dirty-white forest floor. Once, when I was a teenager, I saw a doe and two fawns along this same stretch of road—I remember how calm they were, just looking at none of the cars in particular with a long and steady stare, entranced maybe by the climbing/passing/falling noise of the vehicles. I wonder to myself if they ever made it across the highway. The road passes through a huge swath in the mountain, blasted from the rock, which in turn throws out enormous frozen ice rivers, leaping down the sheer stone face and captured there. To the right is a little town, which I’ve seen so many times from the highway, but have never actually been through—probably because there aren’t the usual travel amenities in the little town. Which, in turn, causes it not to matter to motorists. There are no facilities here, necessary for the traveler, that aren’t provided at an exit several miles in either direction by flashy name-brand, predictable establishments. So, with no more future in coal mining or farming, and no hope to sell gas, coffee, or Twinkies to the travelers, it will likely continue being a town that doesn’t matter, until it matters so little that it ceases to exist. The time comes to exit the highway, and I slide off; now shifting attention to the detailed directions on my little hand-drawn map, to navigate to the guy’s place. End of the ramp and turn right, passing the twenty-four-hour McDonald’s, continuing on through a little village and onto another right-hand turn, onto a series of roads that lead me out into the now dismal, drenched countryside. Over many small hills, past old and new rural houses, some with Christmas lights still illuminated. Each one planted in the icy brown muck, punctuated by a few diehard snow spots, lonely and inhospitable in the cold, vertical rain. In about twenty minutes I have the place in sight, a not-very-meticulously-maintained little farmstead (minus the farm part) that rises amidst a clutter of dilapidated buildings and assorted junk and ephemera. 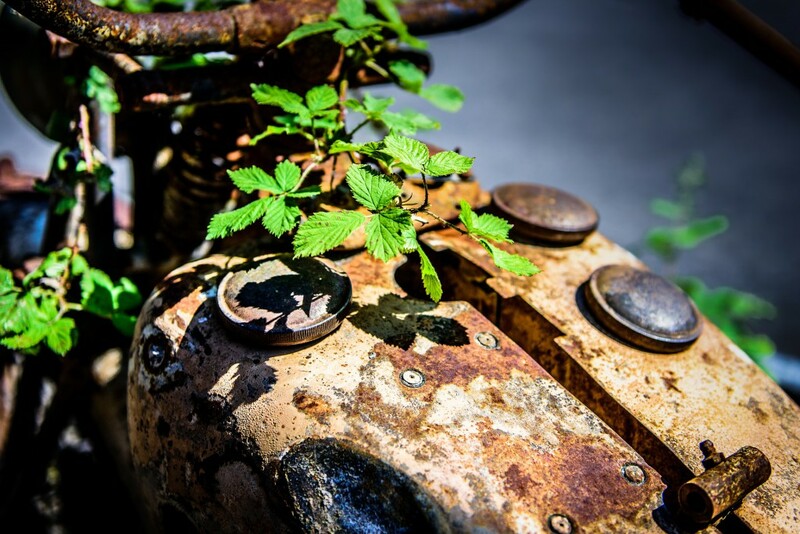 Ancient engine-less tractor hulks, farm implements, and old Jap street motorcycles missing major parts, slowly melding into the mud and vines. After surveying this scene through the fogged-over, water-streaked windows of my van, I park on the driest mound of dirt I can find. I jump out and pick my way towards the house, bouncing on tufts of light brown grass through the brown slush, and am soon knocking on the front door. I thank him and step through the mud-porch, avoiding piles of clothing, blaze-orange hunting gear, dirty boots, and other assorted items that you’d expect to find in a house like this. Animal leg-hold traps hang from nails on the wall; an open box of .22 shells is perched on a cross-member. We enter a kitchen which is quiet and warmer, bathed in the low-wattage orange glow of a single, naked light-bulb suspended from a cord slithering down from the ceiling. Every available inch of shelf space is piled high with more stuff: cereal boxes, food, dirty dishes, boxes of nails; every sort of item. “Do you think I could look at the bikes while your Dad gets here?” I ask. As we head out to the barnyard, I notice that the son is wearing several items of military clothing, and I ask him if he was in the service. I let him know that my Guard unit has openings for his specialty, if he’s ever interested. I walk further. Inside a dilapidated, roofless shed sit two machines. One is amazingly intact, with orange tank and new, twenty-year-old Dunlop rear tire; rusty, but totally complete, looking like the day it was unloaded from the truck on a Sunday evening—a 400 square-barrel. Beside it leans a red-tanked machine, a late-60s 360 with its engine lying to the side, apart and cradling green rain-water in the open cases. What’s that sitting over there—wheels off and engine on the ground? Some sort of road-racer? I pour over the machines in the leaking shed until I can no longer in good conscience keep the boy out in the freezing rain. We make our way back through the motorcycle cemetery, into the house. We talk a bit more in the orange-lit kitchen, and soon Jon arrives. Jon’s entrance is his son’s excuse for retreating upstairs at the earliest break in our now-awkward, three-way conversation. Following the boy’s departure to his overhead hideaway of free-weights and Zepplin, the father begins his story. Forty years; him and motorcycles. He fell in love with motorcycles and the craft of making them go fast early in life, watching the older boys and men ride their Indians, Harleys, and Triumphs near his home. Racing by the time he was in his teens, he recounts being the only student in his little high school to skip the senior trip to the Jersey shore, electing instead to collect the twenty-five dollars cash and put it into his racing (“Hell—that money bought a new top end and entry fees for two days racin’! They thought I was crazy, but I di’n care! Haw!” I’m imagining a flashing sign over his young head: SERIOUS NON-CONFORMIST HERE). Jon began racing the then-obscure West-German Maicos during the mid-1960s, and through the “sponsorship” of a local dealer (parts at dealer cost) was able to race both motocross and eventually road-race events. He seems to remember hundreds of races, each weekend on the road, every difficult section of the most demanding and notable racecourses of the day. He talks on and on. Most listeners wouldn’t be interested in such stories, but this afternoon he’s found a very willing audience of one. He describes the riders, the machines, the winners and the casualties among others such as himself; men who shared the same passion to circumnavigate around the norms of everyday safe, logical and predictable living. Jon worked for the local giant aluminum company as a machinist, weathering corporate changes, layoffs, and relocations many times throughout the last thirty years. He’s the type of old-fashioned guy who takes work seriously, more as a man’s duty than the present-day concept of work as simply an obstacle to leisure. He sometimes rode a motorcycle, he says, forty-five miles—each way—on winter roads to get to work down in Harrisburg when the aluminum plant laid-off. He’s done all that could be asked, and endured it all. Perversely, the asbestosis which now cramps his body will now test the boundaries of even his endurance. Jon knows the likely outcome, and it’s the one topic of our conversation that he cannot cheerfully laugh about. We finish the pitcher of draft beer that the son had earlier retrieved for us, and decide, finally, to head outside and see the motorcycles he has for sale. We walk toward the burial ground, and as I stare ahead at a red, engineless motorcycle hulk with the vine almost obscuring it, I ask the inevitable question. My head is racing and the heart pumping again. I subconsciously remind myself that money is no longer in abundance—especially for personal indulgences like rusty, non-running foreign dirt bikes. Jon had told my friend Terry a year or so earlier that he wanted $500 for everything (Terry walked away). Would he want even more, now? I stare some more at the hulks, straight ahead. Jon stares in parallel, spits, then rolls his lower jaw around a bit as he formulates the answer. We dig through fallen beams and under piles of refuse, reclaiming my treasure. Jon digs hard for every little bit; maybe he believes his stuff is going to a good home. Another gas tank under a fallen door; a wheel there; more engine parts here. Everywhere are bits and pieces of machines so exotic that I could only dream of them as a boy. Magical objects that (along with girls) occupied one or two of every five waking minutes; whose forms became little pencil dirt bike doodles on the class papers of thirteen-year-old boys in sunlit old junior-high classrooms who were supposed to be paying attention to the importance of Iambic pentameter. Motorcycles that, in my juvenile mind, held the secret of flight for the earthbound. In Robert Mason’s Viet Nam autobiography Chickenhawk, Mason recalls his earliest desires for flight; sitting among the stalks of corn on his father’s farm, watching the eagles and hawks float overhead on the rising afternoon land-breezes. He dreamt of levitating like those hawks—flying a helicopter. When I was a boy, I dreamt of cruising through that same hot summer air mass, fast and smooth, free of earth but yet reassuringly restrained by the tire grabbing the warm sod. Quiet and focused under my helmet, racing over the hills with my motorcycle wheels leaving the earth and then gently kissing it again—the flight of a swallow. It’s all enormous fun for me, but eventually Jon is tired, and it’s time to pack this stuff up and leave. We move the van into position and commence loading the material remnants of his youth from the barnyard into the van. 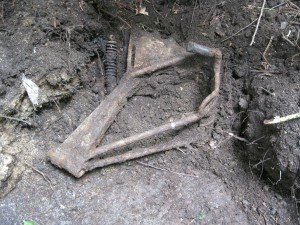 I pay him, say goodbye and thank him for the afternoon, and shimmy down the rutted, muddy driveway; treasure on-board. Leaving the country and the little town with my quarry jostling in the back of the old van, I near the interchange and stop for another quick cup of coffee at the McDonalds (caffeine makes everything even better). Just prolonging the day. I know that once I return to the highway, I must begin the transition from the world I’ve regressed to—and enjoyed so much—back to the real world of responsibility and decisions and obligations. Riding home I think of work; of life, health, and hopes. Of worldly “success”, of material possessions, of love and careers and peace of mind. Will I sell the bikes? Should I sell the bikes?It’s still raining, and turning that deep blue midwinter late-afternoon kind of dark when I pull back into my own little driveway. What a day—back to reality, now. I wrestle with the kids on the way in, sit down in the warm yellow space of the little 1950s-kitchen, and tell the beautiful woman facing the sink and looking over her shoulder towards me of the day’s adventure. At least, as best I can; in terms which try to frame the feelings and time-travel in a way that I hope she’ll understand. Much of what I’ve pondered and enjoyed and experienced today just doesn’t translate very well. But, I do my best. My wife tells me, that’s nice; it’s good that I’ve enjoyed my day, and supper leftovers will be ready in about half-an-hour. Later that evening, in the darkness, I make a few trips out to the driveway, “. . . just to look at the bikes, Hon.” I take in their distinctive angular forms, their incredibly functional lines. Given their sad mechanical state, they undoubtedly look much better in shadow. I examine the bits and pieces, and wonder if I could ever get one running, and how I’d go about finding the parts I’d need. I wonder who built them. I imagine what the part of Germany where they came from looked like. I imagine a guy my age—an old man now—bent over an assembly line, putting these crazy-looking things together. Then other guys like me a world away, buying these bikes and spending the wealth and passion of their youth racing them, fixing them. What made them tick? 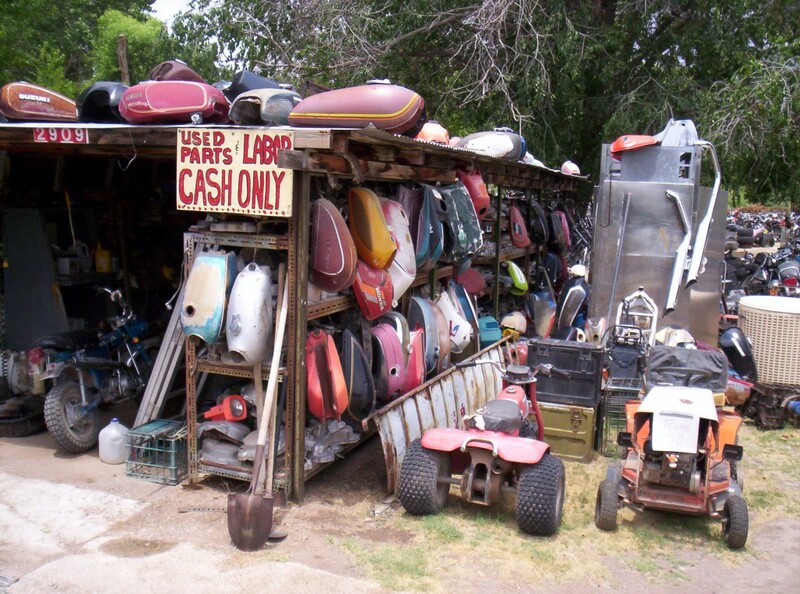 I think of the pro racers whose pictures I cut out of DIRT BIKE and Popular Cycling and hung on my long-ago bedroom wall; the small dealers whose little shops in little towns I remember . . . I wonder what they’re all doing, now. And then: me. Nearly broke, figuring out life, staring into the back of an old Chevy van containing three junk motorcycles in the dark on a winter Saturday night in America. It’s cold. Ten minutes standing, staring into the back of the dark van is all the endurance I can muster. Actually, there are about three or four such trips—just making sure they’re all there and they haven’t scampered off. I return downstairs for the last time that night; my wife looks up and asks me how it was. She smiles as she puts her work aside. She turns to extinguish the table lamp and head upstairs, to bed. I sense, at that moment, that perhaps someone does understand.